Report From The New Day Auction : New Day – There will always be a new tomorrow. There will always be a new dawn. A New Day. 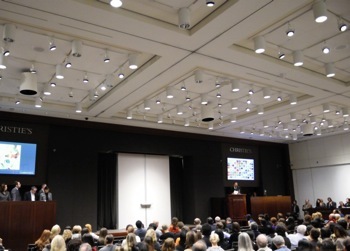 On the morning of November 15, the New Day Charity Auction for Japan was held at Christie’s New York. Despite the early 9 AM start, staff were astonished to find a crowd of people waiting – enough to fill Christie’s largest sale room. 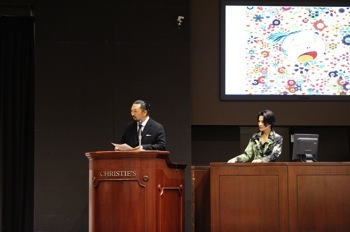 After an introduction from the auctioneer, a nervous Takashi Murakami emerged to give a speech. He was followed by Ken Watanabe, who gave a poetry reading of Kenji Miyazawa’s Ame ni mo Makezu in both Japanese and English. 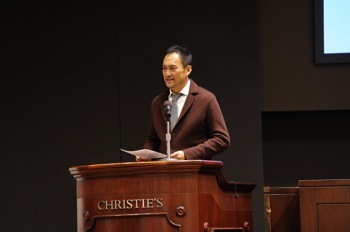 Despite Christie’s long history, it’s safe to say that this was probably the first time an auction had ever opened with a poetry reading in Japanese. Directed at both the audience and the many back home in Japan, the poem’s gentle yet powerful message resonated throughout the hall. As a stillness descended on the room, auctioneer Andrea Fiuczynski, the face of Christie’s Postward Day Sales, began the sale and instantly the room was alive with activity. Though day sales are known for internet and phone bids, on this day, there were several bids from the floor as well and a dramatic tension dominated the proceedings from start to finish . 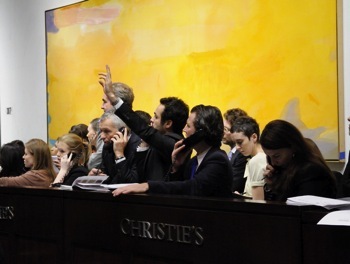 Christie’s staff attended to phone bids throughout the day, raising their hands whenever a bid came in. At times, the bidding came down to a contest of wills between two clients, resulting in applause at the moment of sale. All twenty one words were sold in just under an hour, raising $8,756,100 in the process. In the end, it was a tremendous success. 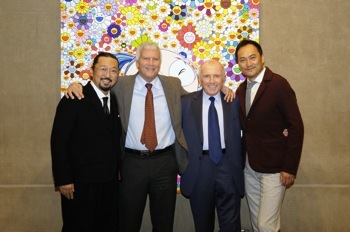 From right: Ken Watanabe, Francois Pinault, Larry Gagosian, and Murakami. Amazingly, this project began from a single email sent by Francois Pinault to Murakami in the aftermath of the disasters. In the eight months that have passed, we have received works from 14 artists and invaluable support from Larry Gagosian, Christie’s, and the Kaikai Kiki staff. It is their work and cooperation that made this day possible. Japan’s road to recovery will likely stretch on for years from now but we hope that this auction will contribute in some small way and offer hope to the residents in the damaged areas.